I finally finished Katy’s view master block for our Piece Bee. Yay…? I’d meant to catch up with the bee in order, but I was having a mental block on (poor, diligent, completely-on-time-for-everyone-else) Phuong’s camera block because I had drawn the design with a ton of Y-seams, so I skipped to this nice and no-brain-power-requiring block. Also, I felt very guilty since I kept reading how Katy received very few blocks. :> But the good thing is that the view master’s instructions made me realize that I could put together the camera block with less stress by using freezer paper and hand sewing it like an English paper piecing thingy! Wahooble! April’s Piece Bee theme was cold and flu, and I sure had a tough time thinking of what to do. I forced my family to help me brainstorm ideas, and my husbo really wanted me to do Grandpa’s cough medicine, but I chickened out. :> I ended up using his other idea of breakfast in bed. Sorta! My computer, she is borken, and Mr. Yazoo is still slowly fixing her. (Even though I work in IT, I make Mr. Yazoo fix our home computers. Hah! Can I say that it’s like how chefs usually eat tv dinners at home? Or is that bad since I’m no IT chef? :D) It’s a pain getting pictures off our camera with any of the other computers, but I finally did it because my Piece Bee block is due and I didn’t want my bee-mate to worry. Plus, I wanted to show off that I mailed it off a whole day before the end of the month! Booyah. So this month’s theme was tropical fishies, which I must say is an evil, evil theme. (Sorry, Lynne! :} ) It did force me to make something I never ever ever never would have attempted on my own, though. Yay, personal growth?! I made a humuhumunukunukuapua’a, and I was so glad that Mr. Yazoo suggested it because they’re surprisingly angular. Yay! As you can see, I’m still bad at planning out how my backgrounds should come out. I spend a ton of time making my initial drawing, then I spend a little time trying to draw my sewing lines, and then I get impatient and just cut up my paper and draw lines right before I sew, which is why the background looks all crazy. Also, when people ask for untrimmed blocks, boy do I leave them untrimmed! This is how it looks, zoomed out. Heh, heh, heh. And here’s my quickie wibbly-wobbly siggy block. It’s in the mail, yo! 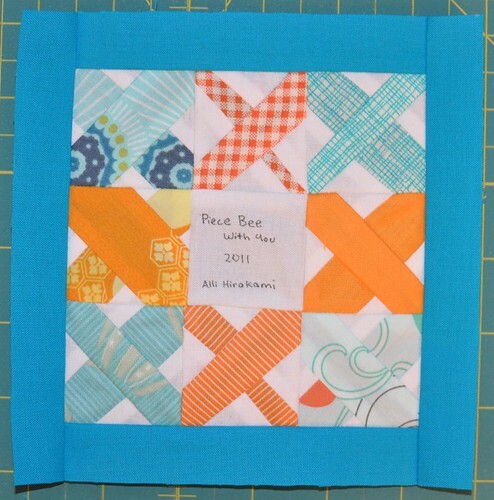 My first original foundation pieced block! I stayed up way too late on Saturday night (til 6:30 am on Sunday!) in order to finish my October block for the Pice Bee With You bee, but now it’s done and I’m so relieved! … and that’s just what I can remember through the intervening haze of two days!